An overnight camping area located along the Mweka route (descent only) of mount Kilimanjaro national park. 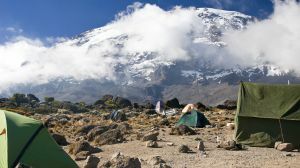 It is primarily used as the last campsite by descending hikers from 5 of the 7 Kilimanjaro routes, namely the Northern circuit, Machame, Shira, Lemosho and Umbwe routes. Most trekkers that use this route would have the option of using this camp that is a lot closer to the gate (Mweka gate) or Millenium campsite further up the mountain, depending on how tired they are. The campsite itself is small, as it is seldom used due to its proximity to the gate. Despite having the name 'hut', the campsite does not have built accommodation, offering only spaces to pitch tents on and toilets. Any other facilities would have to be carried by porter. The 'hut' in its name refers to the TANAPA ranger's hut, a small green metal sheet hut like structure that has been there since the early days of Kilimanjaro trekking. However, the ranger's accommodation has since changed into a wooden cabin situated right next to it. The toilets at the campsite are pit latrines but theres talk of an possible improvement coming in the near future. Mweka hut is located on the lower southern slopes of mount Kilimanjaro and well inside the rain forest climatic zone. The campsite itself is a small clearing amidst the the dense jungle, and barely a three hours walk from the park's exit — Mweka gate. Due to this few people choose to stay here, as its proximity to the exit means if you can make it this far, then why not finish. The other option would be Millenium campsite, about an hours hike away and up the mountain. The area does receive a lot of rainfall and most of the time the ground is at best wet, turning muddy after the rains. Are you associated with Mweka Hut campsite? Contact us to improve this page or create another page for your business.